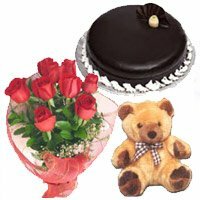 Send Online Valentine's Day Teddy Bear to India Buy and Send Adorable stuffed animals and Toys that are the perfect thing to cuddle, Soft Toy valentine's day gifts from India Flower Mall will delight your loved ones to no end. 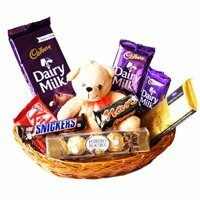 This Valentine’s Day gift your loved one something cuddly, anything your beloved can hug and feel about you when you are not present around. 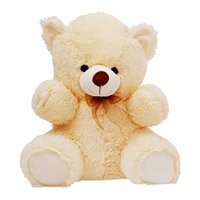 You can choose from a range of Valentine’s Day soft toys gift varying from small cute emoji to a big bulky Valentine's Day teddy bear. 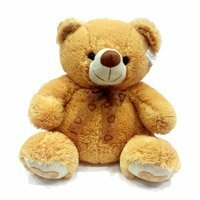 Whenever we think of soft toys teddy bears are the one that first come to our minds and are even loved by all irrespective of age and gender. 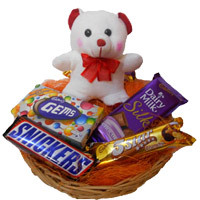 Now, if you are looking to send valentine's day gifts to India or abroad and are in dilemma of selecting the best from soft toys, then you can solely trust on teddy bear this time. It will surely be appreciated by all especially if the receiver is female. 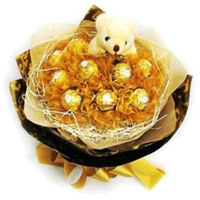 No matter how far or close you are from your loved one, you can easily send a cute cuddly teddy bear to your loved ones. 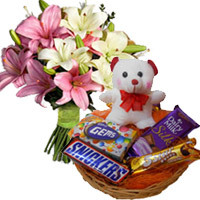 We allow you to choose any particular delivery time and get your gifts delivered on time. 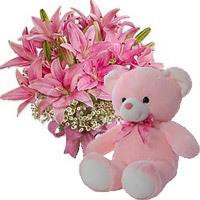 Make Valentine's Day extra cuddly and special with India Flower Mall teddy bear. 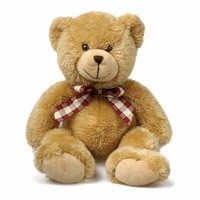 Our selection includes some of the softest and sweetest stuffed teddy bears. 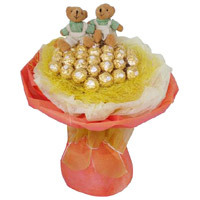 From a small one to a large teddy bear, it is very easy to find a perfect teddy bear with India Flower Mall. 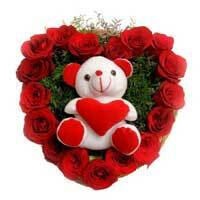 These teddy bears become favorite Valentine's Day Soft Toys to India across generations. 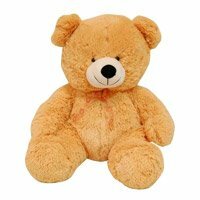 If you want to brighten up your valentine's day and give him or her a lifetime of memories, choose a 30 inch or 24 inch teddy bear to make a big impact on your valentine in India. The teddy bears on India Flower Mall are so cute and lively that they will receive lots of hugs for many years to come. 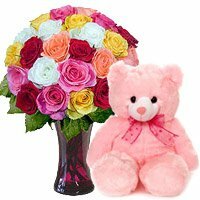 If you are looking for life long memorable cute teddy bear for your cute valentine, place online order to send Valentine's Day gifts to India. 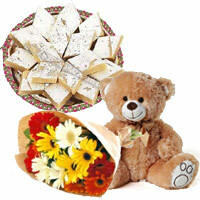 India Flower Mall delivers quality and endlessly cute teddy bears on Valentine's Day. 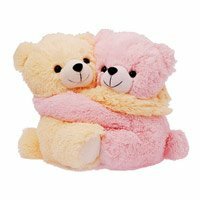 These teddy bears are available in a variety of colors and sizes. 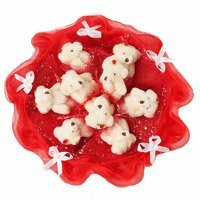 If you want to customize the color of the teddy bear that is listed on the website, let us know we will customer you teddy bear and deliver your Valentine's Day gifts to India. Valentine's Day is approaching very fast. 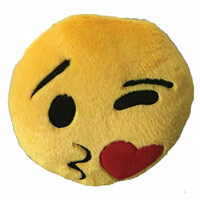 You need to start thinking about this year's Valentine's Day gifts for someone special in India. 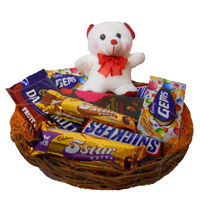 Teddy Bears are one of the most popular choice to send Valentine's Day gifts to India. 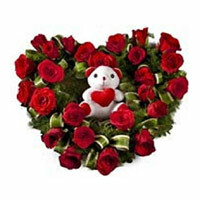 There is a special importance of Teddy Bear on Valentine's Day. 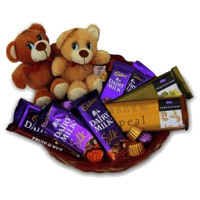 People celebrate Teddy Day 4 days before the Valentine's Day. 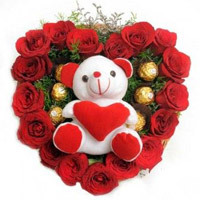 When you give a teddy bear to your valentine, you give love and always-there hug. 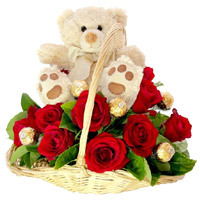 So, teddy bears becomes the favorite Valentine's Day gift. 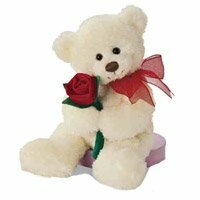 Celebrate Teddy Day and Valentine's Day with a heartfelt Teddy Bear. 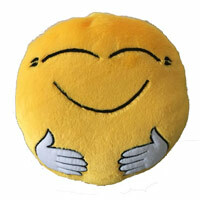 Our Valentine's Day gifts in India are designed to make lovers laugh, spouses swoon and friends smile. 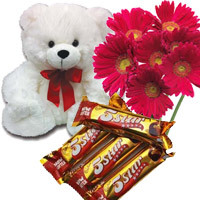 We have teddy bear for every kind of love - friendly to romantic. 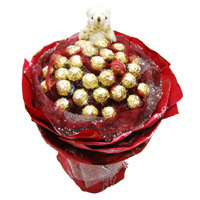 India Flower Mall presents a varity of Valentine's Day gifts in India. 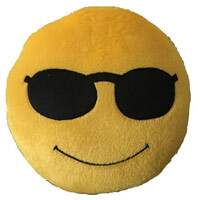 You can choose from the list and place online order for Soft Toys to India. 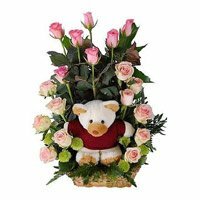 Our Valentine's Day gifts include Teddy Bears from small to big, combination of teddy bears with roses, chocolates and cake. The combinations make the perfect gift for your beloved valentine. 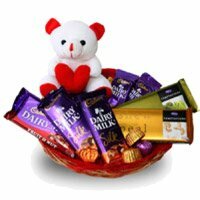 Place order for Valentine's Day gifts delivery in India and let your valentine know how much you care for him or her.